Zappone said she met members from the childcare sector yesterday morning where the issue was raised. 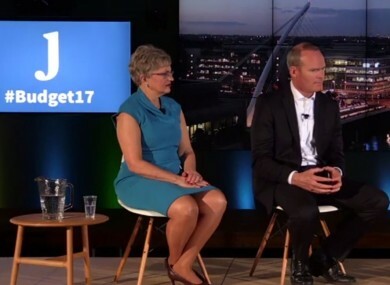 Children's Minister Katherine Zappone and Housing Minister Simon Coveney speaking during TheJournal.ie's Facebook Live event last night in Facebook headquarters in Dublin. CHILDREN’S MINISTER KATHERINE Zappone has said she is exploring proposals to bring childminders into the childcare subsidies scheme announced in Budget 2017. During a Facebook Live interview with TheJournal.ie yesterday evening, the minister said she understood that some parents have a “huge preference” to have their children looked after by childminders, rather than in large-scale creche facilities. “We’re aware of that,” she said. The new scheme announced on Tuesday will provide parental means-tested subsidies towards the cost of childcare for children aged six months to 15 years and universal subsidies of up to €80 a month or €900 a year for all children aged between six months and three years. The subsidies will be paid for children attending a Tusla-registered childcare provider only. Zappone said she met members from the childcare sector yesterday morning, where the issue of childminders was raised. Only 125 childminders are currently registered with the Child and Family Agency (CFA), Tusla. The body has the right to inspect registered childcare services and close them down if necessary. “The first thing we are looking at is how to encourage a greater number of those people to register,” said Zappone. However, she said she understood that once they do register, under current regulations, they have to do a number of things to comply with certain health and safety and child care regulations, to the same standard as a creche. The current Tusla model has been criticised by Childminding Ireland who said the inspection model is a “one size fits” all approach which focuses on creches and doesn’t acknowledge the uniqueness of caring for a child in the home. “We would like to explore that maybe there is another way in which to work with childminders to ensure that they provide the quality that we as the State have a responsibility to see, but perhaps not to do it in the model that is currently operating with Tusla… they have to register with the CFA in order to be supported by the department,” said Zappone. The minister said she has asked Childminding Ireland to work closely with the department to find a way for childminders to be brought into the subsidies fold, by securing Tusla registration, in a less rigorous fashion than is currently the case. I have asked Child Minding Ireland to work very closely with us over the next couple of months and if we can find a way then, maybe we would be able to devise a way to support them. We need to ensure there is safety and quality, but there may be another model in order to ensure quality… it may not be as onerous as it is currently in terms of the Tusla model we are operating. A source from the Department of Children and Youth Affairs said it is looking to see if a “half way house” can be found in terms of regulations for creches and childminders. Childminding Ireland CEO and spokesperson Bernadette Orbinski Burke told TheJournal.ie that a childminder must register with Tusla on the fourth pre-school child a person cares for. Anyone minding two or three children is not required to register. Parents who choose to have their children cared for with these childminders cannot avail of the subsidy announcement. She said there are a lot of misnomers in relation to the term”unregistered childminder” stating that often times these minders are registered with their local city and county board, but just not with Tusla. These childminders are often former creche workers, are fully trained and have first aid training and other certificates. Orbinski Burke was critical of the Tusla inspection method, stating that the “one size fits all” model did not appreciate the unique setting of minding a child in a home. She said creche regulations are often superseded onto childminders working in a home environment. One member of Childminding Ireland was told during an inspections that the person that prepares the food for the children, cannot be the same person that changes the nappies, said Orbinski Burke. “We need them to appreciate the ethos of a minding a child in the home and that these people are working on their own in the home,” she added. Orbinski Burke confirmed that the minister has asked her to sit on a working group, which will include representatives from Tusla and Pobal, to look at a regulatory system that would preserve and acknowledge the setting of minding a child at home. The date to report back to the minister has been brought forward from May. Orbinski Burke said she hopes this is a sign that the urgency of the matter is being taken seriously. TheJournal.ie understands that Tusla and the department have already been fielding a lot of calls from members of the public and childminders wishing to find out more about registering with Tusla. The agency’s funding as increased by €1 million to €68 million to fund additional inspection and registrations regimes, with an additional four inspectors being hired. Fianna Fáil’s spokesperson on Children and Youth Affairs, Anne Rabbitte said she is looking for a commitment from Zappone that she will support childminders. She said she has a number of concerns in relation to the government’s plan, but said she thinks it is a “step in the right direction”. Her biggest concern is that childminders, some that are registered with city and county childcare boards, but not Tusla registered are being left out in the cold. Rabbitte said she wants to see the minister expanding supports for the childminder, by bringing them up to regulation standards. I want her to bring more people into the mix on this. I want a commitment on supports by the minister to bring more people into the fray. While she said the child care plan “is going in the right direction” but said if supports aren’t given to those childminders that are outside the fold, it “defeats the whole thing”. “If over 25,000 children people sign up to this, where are we going to put them if the childminders aren’t accepted. They will have to go to creches, and we will see prices rise… we need to see supports for childminders sooner rather than later,” said Rabbitte. Email “Zappone exploring ways to bring unregistered childminders into new subsidy fold ”. Feedback on “Zappone exploring ways to bring unregistered childminders into new subsidy fold ”.